An incredibly direct Card At Number effect! 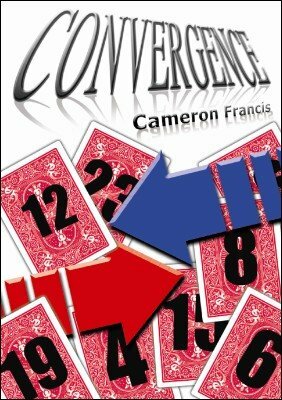 Cameron Francis brings you an amazing card at number effect that plays huge and is extremely practical. The magician proposes an experiment in fate as he introduces two decks of cards; one red and one blue. The blue deck is placed in front of a spectator and the magician never touches it again. The red deck is removed from its case. The magician shows that boldly written on the back of each card is a different number. A second spectator then names ANY card (Really!). We'll say it's the Two of Diamonds. This card is removed from the deck. Another card is randomly selected. Let's say the number on the back of this card is 29. We've got to be up front here, Convergence is not a "Holy Grail ACAAN". It is, however, an incredibly strong and practical effect which plays huge for lay people. 1st edition 2010; 12 pages.